Are you looking for the Best Bluetooth Headphones under $50? If so, then this article is your go-to guide for purchasing a highly affordable Bluetooth headset. Gone are the days when Bluetooth headsets would cost an arm or leg - these days they’re available just under $20, and more reliable models come in at under $50. We’re presenting you with a list of 7 affordable and well-performing Bluetooth headsets that offer excellent price to performance ratio. This product comes in red/black or white/sky blue. Mixcder is a fairly new brand on the horizon and has managed to manufacture some of the nicest headphones and earbuds recently. 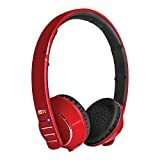 Their Bluetooth headphones have been suggested by many influencers to be some of the best wireless headphones under $50. These have Bluetooth v4.1 compatibility and provide 20 hours of battery life on a full charge.  [Phenomenal powerful bass of Mixcder]:Unexpected 40mm ultra-large dynamic drivers,20 mW rated power, with extremely 13 pcs copper-clad aluminium wires in horn, the heavy bass,the thickness of the treble and the sweet mediant give you a clean sound.  [Incomparable long operation and Bluetooth 4.1]: Ultra-long 20 hours music,20 hours talk and 300 hours standby Time,Go ahead and wear Mixcder ShareMe all day.The latest bluetooth 4.1,decrease the power consumption,enhance the wireless signal and speed up the bluetooth connection.Let enjoy skip-free music in a 10-meter working distance? The USP for Mixcder ShareMe headphones allows you to stream music to two ShareMe headphones via a single smartphone. 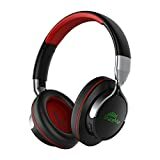 This however is nothing new and is available for many other Bluetooth headphones featured in this list. One downfall to this product may be the florescent green color used for branding and the function notification on them. Last words: Mixcder ShareMes are a decent looking Bluetooth headphone that get the job done. Photive BTH3s are impressive when it comes to a highly affordable Bluetooth headset. They’ve been mentioned in a previous article about connecting Bluetooth headsets wirelessly with a TV. Though plagued with a basic design, Photive BTH3s offer an impressive battery life of 12-15 hours depending on varied use. 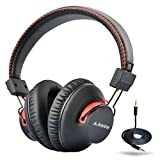 The Bluetooth headphones, a generic micro-USB cable, a 3.5mm audio cable to connect the headphone directly to your mobile without using Bluetooth, and a large hard carrying case. For a Bluetooth headset costing under $50, inclusion of a carrying case is the cherry on top. Design wise, the BTH3 looks very generic and resembles the MEE Audio Air-Fi Matrix that costs under $100 and supports AptX, NFC, and has 22 hours of battery life. The company markets this headset as over-the-ear, however in some cases they don’t cover the entire ear and instead sit on top of them. Made from plastic, the headphones feel sturdy, but won’t be able to take much stress. When not in use we suggest storing them in the provided travel case. The ear cups are padded with pleather and have multiple buttons on either side. Photive BTH3s also provide an inline microphone that can be used while calling and voice recording. They have nice sense of lows as well as strong incision on mids and the highs. However the plastic construction provides average sound isolation and that’s fine for anyone interested in the basics. Last words: Photive BTH3s are a good option if you’re looking for wireless replacement for your regular headphones. If you’re not comfortable with earbuds and want something portable and easy to use, Photive BTH3s are definitely an alternative. The August EP650s have a kind of design that appears generic and cheap considering the price. The affordable Bluetooth headphone market is a competitive field and every now and then there comes a product that has ability to shake the line-up. The August EP650s have done this by focusing less on aesthetic and more on quality. They include a USB cable for charging as well as an aux cable, so users can listen to music without burning out the battery. They also have a foldable design for easy portability. As far as quality they’re pretty decent for basic, day to day use. The ear cups rotate side to side, making them comfortable and easy to adjust. Just like many other Bluetooth headphones, the August EP650s have controls on the band. Thankfully these controls are only on one and not both of the ear cups, saving you from the mess of trying to find buttons on both sides. The total charging time is around 2 hours with a max battery life of 10 hours. Weighing at around 110 grams, the MEE Audio Runaways are the lightest and most stylish Bluetooth headsets on our list of Bluetooth headphones under $50. They are available in 6 different colors: blue, pink, red, white, black/grey and black/red. Since they weigh less than 4 ounces, MEE Audio Runaway 4.0s makes a great companion for jogging and workouts. Inside the box is the headset itself, a USB charging cable, a 3.5mm audio cable, and a trendy carrying pouch. One important we’d like to mention is that in photos this product appears to be on the small side; however the ear cups hold 40mm drivers and sit over the ear entirely. Because they are lightweight there isn’t any uncomfortable feeling of clamping. The downside to this is that there isn’t great sound isolation. The Bluetooth 4.0 streams music wirelessly with support for A2DP. There’s also a built in microphone that allows for receiving calls and voice recording. Although this product is manufactured with plastic, they don’t appear cheap, and are study enough to withstand a few drops here and there. Just don’t make a habit of it. You have three horizontal buttons, all of which include blue indication lights, that have functions for power on/off, call end/receive, fast forward/rewind, volume up/down. Check out the full review here. The Bluedio T2 Plus is the biggest headphone set on our list so far. The driver inside is 57mm in diameter. 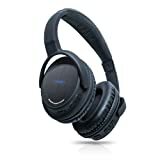 With over tons of 4 and 5 star reviews on Amazon.com, the Bluedio T2 Plus is clearly a popular Bluetooth Headset choice among consumers. Since they cost just under $50, the body construction is entirely plastic, but the build is sturdy and body doesn’t squeak or squeal. They look high-end and it’s hard to believe that they’re priced under the $50 range. 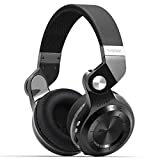 NOTE: Original Bluedio T2 Plus Turbine Headphones sold by" Bluedio".ã€Foldable & Portableã€'195Â°rotary design, to save more space and easy to carry& Support Micro SD card(up to 32G) and FM radio. ã€Î¦57mm Ultra-Big Speakerã€'brings amazing bass for you. But its impedance is only 16Î, easy to drive by smart phones, tablets and PCs. ã€Bluetooth 4.1ã€'the latest Bluetooth version, brings top speed & power saving & enhanced transmission, superbly compatible with iOS, Android and Microsoft, a perfect match for 4G, standby time up to 1625hrs. ã€Line-in Audioã€'to enjoy music without interruption. Line-out audio, to share music with your friends anytime. As with other products on our list, these ear cups fold over and are easy to store. The hinges tend to move the headphones in upward direction even with a slight unintentional push, and this can be frustrating if you’re active when listening to audio. The box includes the headset, a 3.5mm audio cable, and a USB charging cable. 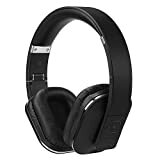 Two features that Bluedio T2 Plus provides that other headphone manufactures don’t are the FM radio and a Micro SD card support. You may notice that the buttons on this product are not of high quality. It’s up to you how much that matters – in the end, it’s not entirely damning for a product listed under $50. The Bluedio TD Plus makes use of Bluetooth 4.1 support along with A2DP. It also offers 40 hours of listening time, allowing you to enjoy your music for an extended period. The Avantree Auditions are a standout in the looks department on our list. They sport old school Grados-like design -instead of heavily padding on the headphone, they’ve reduced the weight by keeping the material use to minimal. Let’s start with one important piece of information: the Avantree Audition weighs only 180 grams, and that’s a great deal since it means a longer duration for listening to music. The style is somewhat gaudy, with red ascents over black; but it is a unique look that stands out against others on the list. Construction is all plastic, with the headband made up of a hard leather-like material. Overall the construction appears sturdy, and the ear cups are padded comfortably enough to remain in the correct position when in use. They do tend to have some clamping force though, making them stick close to the ears. 【Superior hi-fi sound】experience high-resolution sound with aptX hi-fi technology. Excellent sound reproduction with wide Audio range producing rich bass and clear treble, challenging many much higher priced headphones on the market. 【Comfortable & super light】these over-the-ear wireless headphones come with super soft ear-pads and an easily adjustable headband providing a comfortable, customized fit. An ideal choice for long periods of music, watching TV. 【Multipoint and easy to use】 Connect to two phones simultaneously and never miss a call. Use the NFC feature for easy one tap Connection. After initial pairing headphones auto-reconnect to any device, easily and instantly. Buy one for yourself and an extra set for an audio lover you know today! 【What you get】avantree stands behind this product with a 24 month . In addition our responsive email support team are also available. An impressive aspect of this product is its sound leak – for being so minimal in design, there is very little sound leak even at full volume. They also pack a lot of punch when it comes to sound quality, but they don’t quite stand up to their wired counterparts. Casual listeners will enjoy this device the most. Button and port placement on the Avantree Audition is done smartly as well, with one long button that acts as volume control and the center section handling Bluetooth pairing and power. The Audition comes with a 3.5mm headphone jack, NFC support, built in microphone, and a charging port kept safely inside a rubber flap. Technically the Ausdom M08 isn’t under $50 (at the time of this article being written), however it isn’t very far off from our price point and therefore we believe it has earned a spot on the list. Available in two color combinations, black/silver and black/red, the Ausdom M08s have a stylish appearance. On Amazon.com this product has reviews from 120 customers and a rating of 4.4 stars out of 5. You probably haven’t heard about the brand until now, but with reviews like that we think the Ausdom M08s are worth a look. With a built in battery of 400mA, the M08 provides a standby time of 250 hours and playback time of 20-25 hours max. This includes Bluetooth 4.0 technology with support for EDR, allowing for delivery of quality sound without using much juice. Though they’re completely carved out of plastic, they happen to be extraordinarily sturdy and stylish, making it hard to believe that they cost just over $50. Ausdom has used a matte finish on the headband, while the outer ear cups have a brushed aluminum finish. Great for travel: soft, comfortable, solid and foldable headset construction for long time use. Bluetooth V4.0 technology allows M08 to communicate with your Bluetooth enabled device within 10 meters range. Optional connection via 3.5mm audio cable for streaming music without worrying battery dead. Powerful and rich bass speaker brings you amazing audio enjoyment. HD call design with built in microphone, can support free hand talk. The best part about the Ausdom M08s is the ear padding. The cups are large and meant for long use, meaning the focus is on making them comfortable. They also feature a foldable design and can be stored easily, however the company doesn’t provide a carrying case. We always suggest purchasing a strong and rigid carrying case for similar products, as they’re plastic and are prone to damage.